Camping is the time for cooking on the grill and for enjoying a variety of foods you can’t eat all year. Making a flavorful marinade can add to the flavor of your food making the meal even better. 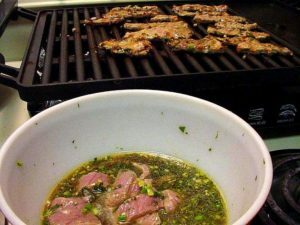 Marinades can be used on meat, poultry, even vegetables. Here are a few you might like to try. 1 teaspoon chopped garlic (if desired) or you can use 1/4 teaspoon of garlic powder. Add in 3 to 4 pounds of meat (slice thinly or leave whole depending on what you’re planning to cook for dinner). Allow the meat to marinade for several hours or overnight and cook as desired. The longer the meat marinates, the more tender and flavorful it will be when it’s served. 4 to 6 baking-sized potatoes scrubbed and sliced into bite sized pieces. You can use carrots, celery, and mushrooms or other root vegetables as desired as long as you reduce the number of potatoes accordingly. One 12 ounce can of beer if desired. Allow the above to sit and marinade for 2 hours and then bake either in a campfire or a hot oven until the vegetables are tender. Serve hot and enjoy. Special Note: When preparing chicken or pork, pre-cook the meat and brush the marinade on the meat as it’s cooking for the best results. Adjust these recipes to your family’s taste preferences.